The theories of supply and demand do not apply just to markets for goods. They apply to any market, even markets for labor and financial services. Labor markets are markets for employees or jobs. Financial markets are markets for saving or borrowing. As a college student, you most likely participate in both labor and financial markets. Employment is a fact of life for most college students: in 2011, according to the BLS, 52% of undergraduates worked part time and another 20% worked full time. Most college students are also heavily involved in financial markets, primarily as borrowers. Among full-time students, about half take out a loan to help finance their education each year, and those loans average about $6,000 per year. Many students also borrow for other expenses, like purchasing a car. We can analyze labor markets and financial markets with the same tools we use to analyze demand and supply in the goods markets. Let’s take a look at a few examples. Economic events can change the equilibrium salary (or wage) and quantity of labor. Consider how the wave of new information technologies, like computer and telecommunications networks, has affected low-skill and high-skill workers in the U.S. economy. From the perspective of employers who demand labor, these new technologies are often a substitute for low-skill laborers like file clerks who used to keep file cabinets full of paper records of transactions. However, the same new technologies are a complement to high-skill workers like managers, who benefit from the technological advances by being able to monitor more information, communicate more easily, and juggle a wider array of responsibilities. So, how will the new technologies affect the wages of high-skill and low-skill workers? For this question, let’s again use the four-step process of analyzing how shifts in supply or demand affect a market. Step 1. What did the markets for low-skill labor and high-skill labor look like before the arrival of the new technologies? In Figure 1(a) and Figure 1(b), S0 is the original supply curve for labor and D0 is the original demand curve for labor in each market. In each graph, the original point of equilibrium, E0, occurs at the price W0 and the quantity Q0. Figure 1. (a) The demand for low-skill labor shifts to the left when technology can do the job previously done by these workers. (b) New technologies can also increase the demand for high-skill labor in fields such as information technology and network administration. Step 2. Does the new technology affect the supply of labor from households or the demand for labor from firms? The technology change described here affects demand for labor by firms that hire workers. Step 3. Will the new technology increase or decrease demand? Based on the description earlier, as the substitute for low-skill labor becomes available, demand for low-skill labor will shift to the left, from D0 to D1. As the technology complement for high-skill labor becomes cheaper, demand for high-skill labor will shift to the right, from D0 to D1. The new equilibrium for low-skill labor, shown as point E1 with price W1 and quantity Q1, has a lower wage and quantity hired than the original equilibrium, E0. The new equilibrium for high-skill labor, shown as point E1 with price W1 and quantity Q1, has a higher wage and quantity hired than the original equilibrium (E0). Now let’s examine how the theories of supply and demand also affect financial markets. Imagine that the U.S. economy became viewed as a less desirable place for foreign investors to put their money because of fears about the growth of the U.S. public debt. Using the four-step process for analyzing how changes in supply and demand affect equilibrium outcomes, how would increased U.S. public debt affect the equilibrium price and quantity for capital in U.S. financial markets? Step 1. Draw a diagram showing demand and supply for financial capital that represents the original scenario in which foreign investors are pouring money into the U.S. economy. 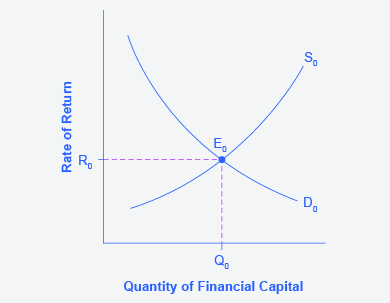 Figure 2 shows a demand curve, D, and a supply curve, S, where the supply of capital includes the funds arriving from foreign investors. 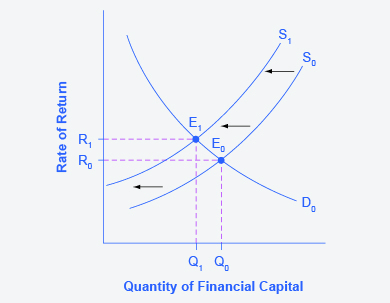 The original equilibrium E0 occurs at interest rate R0 and quantity of financial investment Q0. Figure 2. The graph shows the demand for financial capital and supply of financial capital into the U.S. financial markets by the foreign sector before the increase in uncertainty regarding U.S. public debt. The original equilibrium (E0) occurs at an equilibrium rate of return (R0) and the equilibrium quantity is at Q0. Figure 3. The graph shows the demand for financial capital and supply of financial capital into the U.S. financial markets by the foreign sector before and after the increase in uncertainty regarding U.S. public debt. The original equilibrium (E0) occurs at an equilibrium rate of return (R0) and the equilibrium quantity is at Q0.